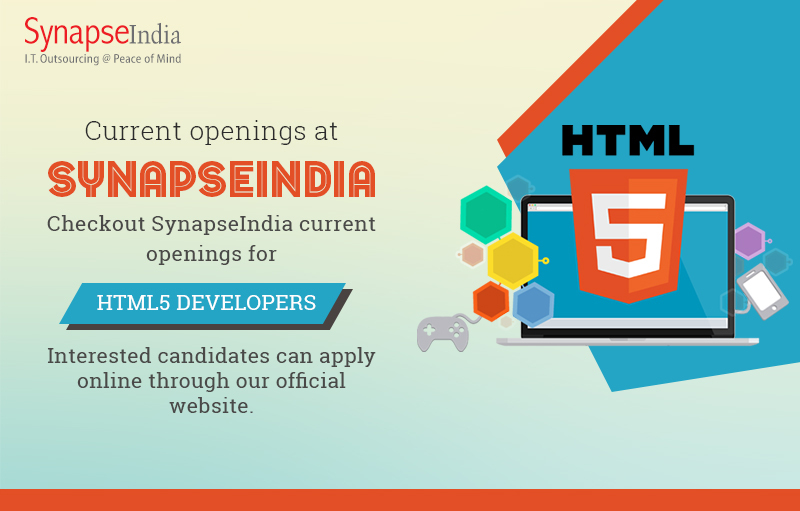 Take a look at SynapseIndia current openings for HTML5 developers at the Noida based corporate office of India's premier IT company. We’re hiring for professionals who are experienced in HTML5 design and development. SynapseIndia, the prominent web & mobile development company in India, specializes in developing top notch HTML/ HTML5 apps, for both web and mobile. A dedicated team of HTML5 professionals make sure to provide a sophisticated user experience across all mobile platforms. Our professionals bring the ability to think beyond and offer you with best-in-class solutions. Want to become a part f like-minded team of IT professionals, checkout SynapseIndia current openings and apply online.